A Mile of Precious Coastal Access Worth Preserving! The scenic, ocean-front Asilomar Coast Trail is a highly popular tourist destination on the Monterey Peninsula, with hundreds of visitors enjoying this coastal refuge each day. It is a popular recreational area for numerous local community members where exercising, walking dogs, observing wildlife, or simply taking in the views of the dramatic rocky shores coastline is regularly enjoyed. Tourists often visit Asilomar State Beach, known for its famed white sandy beaches and stunning coastal views, on their way to Pebble Beach’s 17 mile drive. Since its inception in the 1990s, the Asilomar Coast Trail has successfully allowed sustainable coastal access to high-quality recreational opportunities while protecting the area’s treasured natural resources. The area is home to endangered plant species such as the Menzies’ Wallflower and the Tidestrom’s Lupine. The Asilomar Coast Trail dune habitat also contains many rare animal species, most notably, a species of concern, the Black Leggless lizard. The rugged, granodiorite shoreline hosts and affords protection for a number of nesting shorebirds such as the Black Oystercatcher. In addition to the Natural Resouces of this habitat area, the Asilomar Coast Trail has several sizable and significant archeological midden sites. Over the years the Asilomar Coast Trail has been maintained primarily by California State Parks Asilomar Natural Resources Crew, which has performed trail tread repair work, drain installions, fence installion and repair, and boardwalk repair. There have been several significant property additions such as the Asilomar Rocky Shores Aquisition in 1995 that added more boardwalk, a gazebo, and a bridge, which was completed with the aid of contractors, volunteers, and other Monterey district staff. All of this work has kept the mile-long Asilomar Coast Trail open to the public despite the use by thousands of annual visitors, in addtion to the geologic impact of severe winter storm cycles. There are several sections of the coast trail that are now being threatened by increasing natural erosion, likely fueled by climate change, which is causing projected rising ocean levels and an increased severity of winter storms. Since the 1990s, these sections of boardwalk have washed away, and many more are now compromised. The current Asilomar Coast Trail Restoration Project’s goal is to keep the coast trail safe, accessible, and sustainable, so that it can serve the visiting public for another 25 years. Installation of permanent split rail fencing along Sunset Ave.
Delineated parking spaces and trail entrances. Construction of the single trail between Sunset Ave and the Ocean. Trail was built with a mix of decomposed granite trail and wood boardwalks. Allowed access to all the beaches and rock outcropping while concentrating all foot traffic onto maintained trails in order to preserve the ecological integrity of the natural habitat areas. This 1986 project was essential to the overall restoration of the sand dune ecosystem. Encouraging visitors to walk only on the designated trail and through designated entrances, allowed native dune plants to survive and naturally repopulate the habitat area without competition from sustained foot traffic. 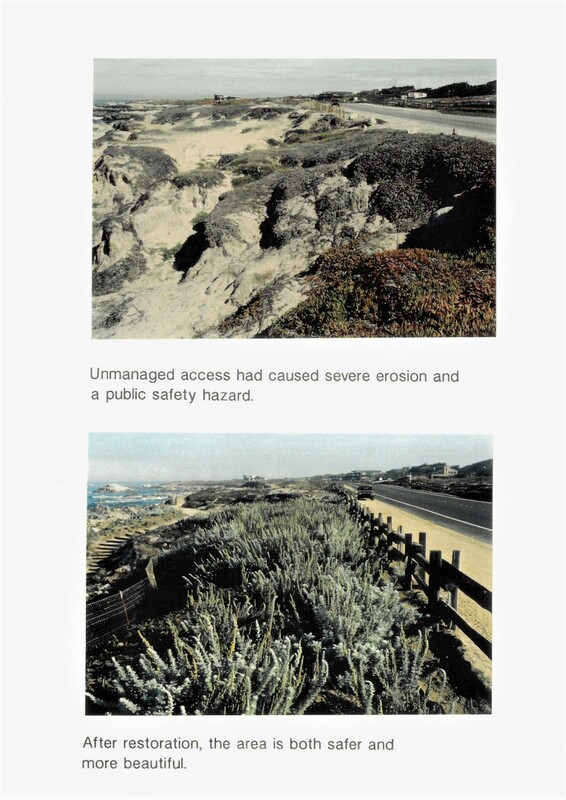 The 1986 project documents also reference the potential for future sea-level rise as a result of the “greenhouse effect” (Climate Change), and acknowledges that some sections of the Asilomar Coast Trail would likely need to retreat inland. surface is a mix of compacted decomposed granite and boardwalks that can be accessed from twenty-seven different entrances along Sunset Avenue, where roadside parking is available. The Sunset Avenue parking is owned by the City of Pacific Grove, and is mostly unpaved but reinforced with packed decomposed granite. ADA parking is available at certain points along the road. This decentralized parking scheme created a need for several accessible, convenient trail entry points for visitors, while allowing for protection of the sensitive dune habitat. The original project accomplished these goals by establishing these twenty-seven entrances to the coast trail by installing split rail fencing to direct people towards the offical, pre-determined entrances. Thirty-six years later, many sections of the Asilomar Coast Trail are being compromised by coastal erosion, which has necessitated the removal of boardwalk sections. Without the boardwalk, the trail becomes much less delineated, stable, and enjoyable to walk on. As a result, the trail often gets wider as people search for a better surface to walk on. The widening of the coast trail and the trail access points is having a negative effect on native plant communities as there is a tendency to walk “off trail” through the dunes when there is no compacted (and preferable) surface to walk on. The survival of rare and endangered plant species that are often found right next to the trail is being compromised by this type of use. Former boardwalk site being widened by trail use. Current boardwalk section, compromised by coastal erosion. The project will impact approximately 0.5 miles of the current Asilomar Coast Trail. Restoration of 1,220 linear feet of decommissioned trail. 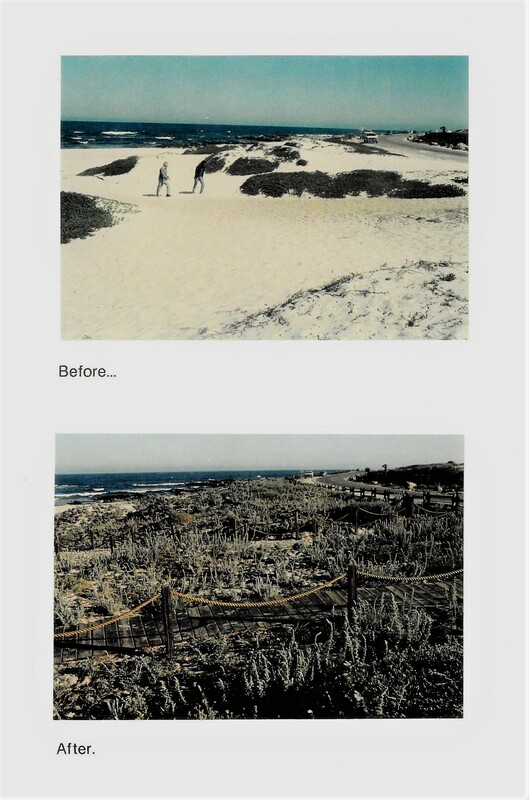 The Asilomar Coast Trail Restoration Project has been reviewed for CEQA compliance and has a Coastal Development Permit from the California Coastal Commission. The project is slated to begin November 6, 2018, and will be constructed by “in-house” California State Parks staff. The projected timeframe for completion is from 6 months to 1 year.